Selling cups of tea, "vetkoek" (mag w i n y a ) and loose sweets requires patience. If street sellers are not patient they will not be able to make money and support their families or send their children to university or college, says Leah Mahlangu. Mahlangu's two children Joseph and Mduduzi are studying at the higher education level with the money she makes from selling sweets, magwinya and cups of tea. Her son Joseph got a Diploma in Marketing and is studying for a B-Tech degree in Marketing at Tshwane University of Technology. Joseph's younger brother, Mduduzi, is studying for a Diploma in Tourism at Damelin College. 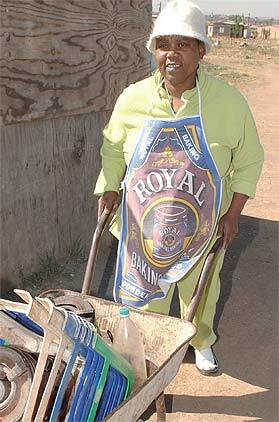 Mahlangu started selling at the local taxi rank in Nellmapius township in 1999 after she lost her job. She makes between R300 and R400 a day. She wakes up at 3:30 every morning to prepare the goods she will be selling. 'It's really difficult to be a breadwinner', she says. 'I leave home at 4:30 in the morning and push the full trolley with goods to the taxi rank. I work the whole day, even if it's raining heavily.' 'But my hard work has paid off, because my children are getting education at a high level,' she said. 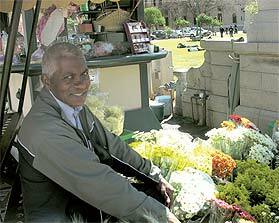 After he lost his job as a clerk, Sommas Nadasen of Laudium started selling flowers, silver vases, wheat and wreaths. He said it was painful to lose his job after working for the company for 20 years. But Nadasen couldn’t afford to feel sorry for himself. Selling in the streets was the only way to survive and pay for his children's education. He said it was difficult to support the whole family because his two school-going children had no bursaries. One of his children will finish his law degree at the end of the year and one is finishing matric. With the money he makes from selling in the street, he also pays rent, buys food and pays accounts for the whole family. 'As the breadwinner, I also give my children money for transport and pocket money when they go to school,' he said. Nadasen wakes up every morning at 4 o'clock to prepare for the day's selling. Musa Nkosi, 25, is a breadwinner who sells fruit on Church Square in Tshwane. He was born at Mkhuhlu village in Mpumalanga. Before he could finish his matric, he travelled to Tshwane to search for a job because he had to support his mother and two sisters. Nkosi started selling fruit and snacks after surviving from piece jobs for five years. 'It's better to sell fruit in the street and make an honest living than robbing people,' he said. He makes between R400 and R500 every day. His expenses include paying for the room he rents, food, transport to take his goods to town and sending his mother between R1 500 and R2 000 a month for food. 'I opened a bank account and I want to use some of the money to complete my matric', Nkosi said. He plans to continue studying at university level in Business Management.